Carryings On Up The Dale: Une position magnifique? Non. 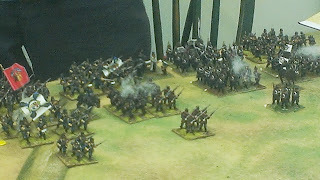 Nigel set up a 28mm Franco-Prussian War battle at the Club this week, again using Black Powder. 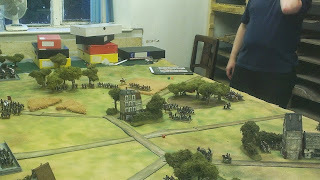 The French were deployed on the table with a brigade in advanced positions holding woods on either flank with a third brigade holding a village in the centre. 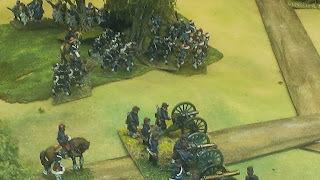 Two batteries of guns and mitrailleuse supported the centre while a brigade of cavalry lurked behind a wood in the centre. The Prussian were supposed to march onto the table, throwing randomly for each brigade to see which road each would enter on. Over the half of them ended up entering the road facing the French right while the other two were due to enter one in the centre and the other against the French left. Well that was the plan. Paul used his C in C to try and get all his troops on table and managed a mere one move. This meant that as the other Prussians were too far away the Prussian turn was over as the C in C is the last commander to give orders. Paul still managed to cause some casualties on the French holding the wood and disordered a regiment in a cornfield. 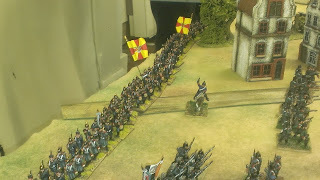 The French didn't need to do much in their turn except for throwing a regiment out onto a hill on the far right flank. Their command throws were quite bad anyway. They did manage to disorder and shake a Bavarian regiment with long range Mitrailleuse fire which was fun. At the end of the turn we threw for reinforcements and on a score of a 6 were destined to enter on the left flank in the following move. Turn 2 and the Prussian right and centre failed their command rolls so were unable to enter the table. 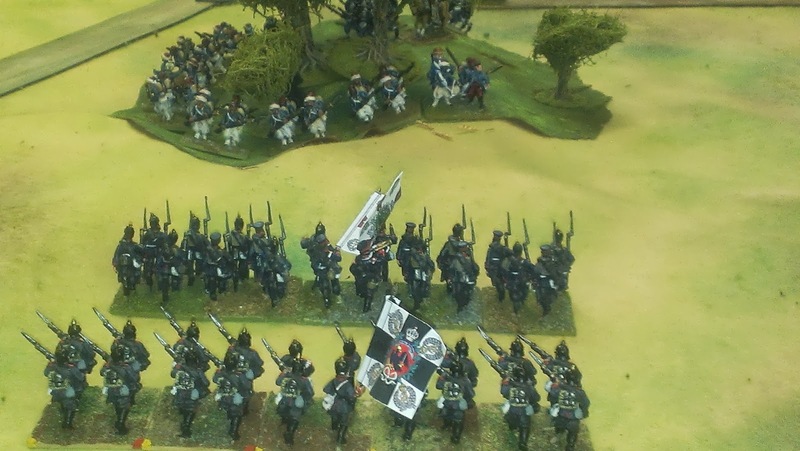 The Prussian left boldly charged the Frenchmen the hill and in the woods. 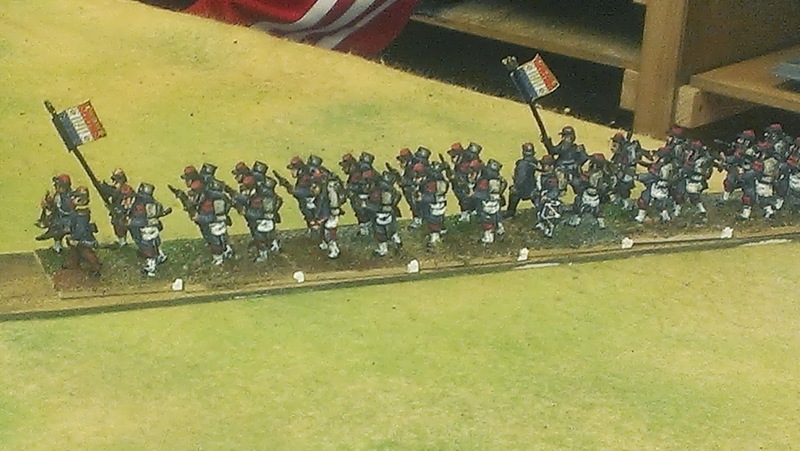 The latter withdrew but the other regiment failed miserably with their closing fire and while disordering both units charging them, failed to cause enough damage to stop them. However, they survived the melee and subsequent break test. In the centre the cavalry moved pver to the roght flank and a Turco battalion blundered and stopped all movement. The reserves made a very slow entrance onto the table thanks to my usual poor dice throwing. The mitrailleuse missed and there wasn't much else for the French to shoot at. 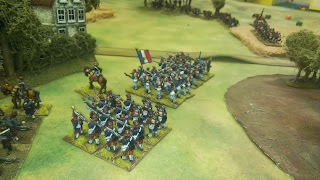 In the French melee turn their regiment lost the fight and broke. Turn 3 saw the Baden brigade enter the tale in the Prussian centre and promptly do a right turn and march off to the right flank. On the right the final brigade made it onto the table and advanced towards the woods, occupied by Turcos and Chasseurs a Pied. Sadly, that was when I had to leave I remembered I'd left the iron on in my Metz apartment. In truth I I had a very early start on Friday so hopefully someone can fill in the detail and report the outcome of the battle in the comments section of this entry. Figures are all Foundry from the collections of Nigel and Conrad. Great stuff. I love this period. What rifle ranges did you use? Mon General, it is I Brigadier Jean le Rouge. Some highlights of the battle, which remains poised on the sabre edge when we had to call it a night. Almost two separate battles being fought at either end of the table. With the departure of our glorious General to see to his ironing, the French reshuffled their command, with me taking over the left hand side of the field and Nigel the right. As the Prussian centre had shifted to their right, we were facing a pincer attack with nothing facing our centre but a couple of lonely artillery batteries hugging the back line. I moved the reserve brigade up, very slowly, in march column and much more rapidly redeployed the divisional artillery to cover the gap between the two woods. By now dark ranks of (Ians) Prussian infantry were massing for a push against the woods screening our village. 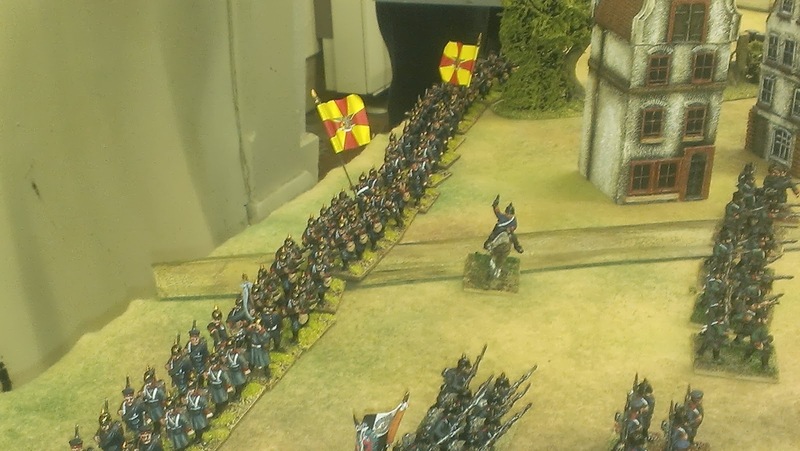 Meanwhile the Baden brigade defiled through the town in typical Germanic fashion, to fall in behind the first Prussian brigade. The first Prussian regiment charged the woods seeking to drive away the Tirailleur Algeriens, in skirmish order, lining its edge. 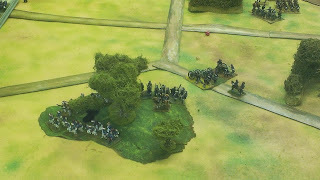 The Tirailleur officers were divided as whether to fall back (evade)or trust to their Chassepots and stand their ground. (we did nt know if you had to evade or got the option). As the Prussian hordes stormed in, a decision was made, and closing fire crashed out and perhaps due to the indecision entirely failed to check the Prussian advance. Le catastrophic non! Prussian glee at getting to grips with the skirmishers was short-lived. The Tirailleur Algeriens could nt shoot straight but they could certainly use their bayonets (five 5s rolled and as tough fighters the miss was rerolled to get a 6th 5). The Prussian attack was well and truly repulsed!! The Prussian brigade now in the open was then subject to the massed fire of the divisional artillery, the reserve brigade and the jubilant Tirailleur Algeriens. In short order casualties mounted and the brigade streamed back behind the Badeners. (The brigade had 3 of its 5 units shaken but a house rule allows the general to try and rally off and potentially restore brigade morale, which Ian managed to do). 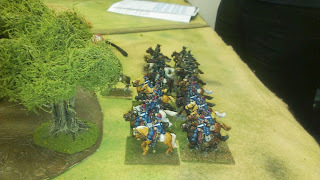 The Badeners covered their comrades and advanced to make their effort on the wood, more sensibly relying on fire power. On the French Right, the fighting ebbed and flowed across the wheat field, woods and hill. The French CinC moved troops from the centre and the cavalry reserve up to prevent the Prussian hordes sweeping round the flank. Initial Prussian attacks on the hill were successful with the French regiment holding the hill swept away. More ominously, the dreaded Uhlans moved up in support. 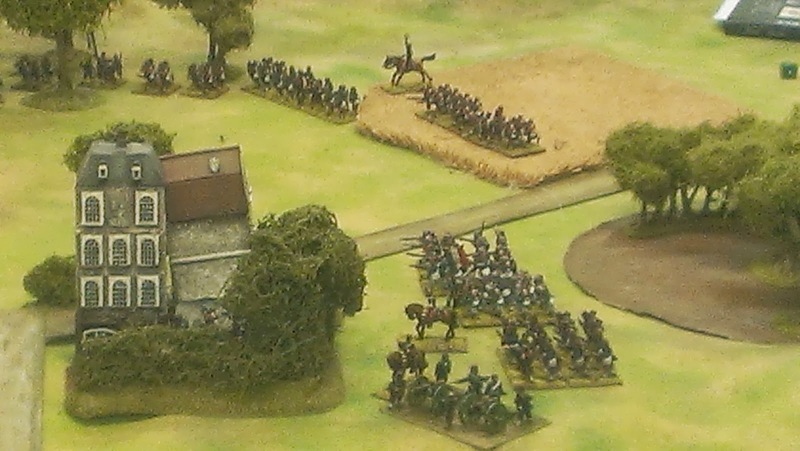 Seeing their chance they charged, the French chasseurs a cheval countered while French skirmishers scampered away. 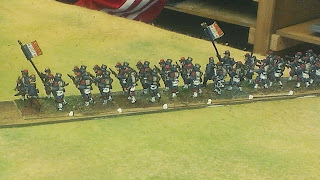 Repeating their success of the 1866 war, the Uhlans scattered their French opponents and rode down the evading skirmishers (via a sweeping advance). Merde!. However elsewhere the Prussian advance was stalling, in the face of counter attacks coming out of the corner field and into the woods, pushing back Prussian infantry whilst long range chassepot shooting pinned down their supporting Bavarians. 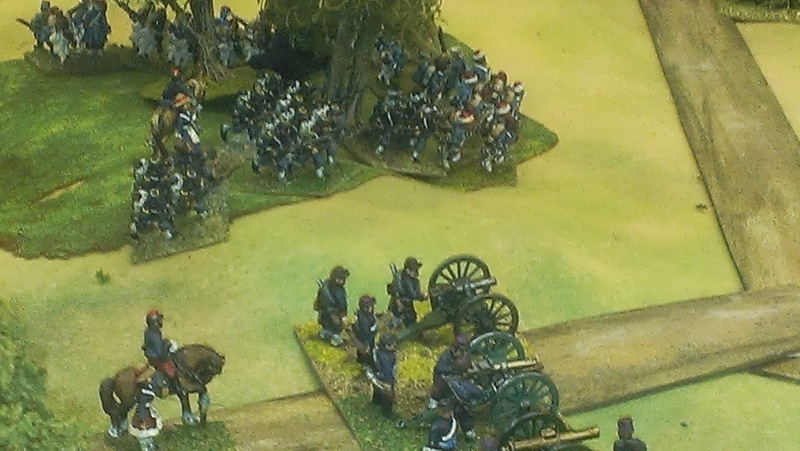 As the Prussian generals countered their dead they recalled their greatly superior but as yet un-used reserve artillery and requested they march to the guns. They moved to join the batteries in the centre. Thanks for the update John. Sounds like I should leave early more often! Very nice report, glad to see this period and these minis, loking like a great game!